We were founded in December 1998, and have been making friends and community ever since. Although our Chapter is small in size, it is large in leadership and enthusiasm. Our members have served as officers and committee chairs for the Florida Native Plant Society almost continuously since the Chapter's inception. Currently, member Gene Kelly serves as Government Policy Chair for the Society and our Chapter is assisting in planning the 2019 FNPS Conference in May. We will be leading many field trips throughout our region. The Hernando Chapter Officers are elected each year in November, for a maximum of four consecutive terms. The Committee Chairs are selected by the President and serve at the pleasure of the President. All committees welcome volunteers of all interest areas and talents. To read more about it, see Hernando Chapter Bylaws! I am proud to be a founding member of the Hernando Chapter which got rolling the year of my daughter's birth, 1999. Here in Hernando County we've got it all – sandhills, coastal marshes, and all the other landscapes of the Brooksville Ridge. For several years I served on the Hernando County Sensitive Lands Advisory Committee on behalf of Forestry; I was an Ecologist with the Florida Forest Service for many years before recently becoming a Supervisor. You may have heard about our success in managing the Croom tract of the Withlacoochee State Forest for red-cockaded woodpeckers, and our success in establishing them in our forest. I'm also engaged in controlling all of the invasive exotic plant invaders that have made their way into our public lands. I have now been a member of the Hernando Chapter for many years, and am now Vice President since I termed out as board secretary for our Chapter. I live in Shady Hills area of Spring Hill with numerous misfit animals. I am a Florida native (like my plants) who grew up in Hudson with my folks and three brothers. My mother is mostly to credit for instilling my love and appreciation for gardening and nature from an early age. Growing up, I spent countless hours out in the Florida woods with my family and friends but it was not until my later years that I fully realized how fragile and precious natural Florida was. I ultimately decided to steer my life and career towards natural sciences to try and protect our natural resources and environment. Being a member of FNPS, and especially this chapter, has proven to be a perfect vehicle for my ambitions as a steward of natural Florida as well as my long-time love of plants. 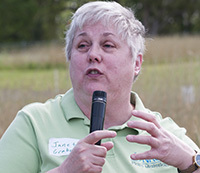 Janet Grabowski has been the Manager at the USDA, Natural Resources Conservation Service (NRCS) Brooksville Plant Materials Center (PMC) in Brooksville, Florida since May of 2005. She began her career with the agency in 1991, where she worked as a Biologist and Research Agronomist at the Jamie L. Whitten PMC in Coffeeville, Mississippi. During her tenure with NRCS, she has gained extensive experience in native seed production and plant restoration methods. She has BS and MS degrees in Horticulture from the University of Illinois. I was born in Tampa where I lived most of my life. My family and I always enjoyed camping and had a tradition of spending Thanksgiving week in the woods – even after our children were married we all still went to the woods for Thanksgiving. In 2000 we sold our home in Tampa and moved to 10 acres of wooded property near Brooksville and cleared about 2 acres for our house and pole barn. We wanted to live in harmony with nature not drive it out so the rest of the property was left as it was. My husband passed away in 2007. I begin volunteering at Chinsegut Conservation Center (FWC) and later at Dade Battlefield Historic State Park. I also joined FNPS and begin to learn the names of the plant life. My volunteering has brought me closer to nature, with a better understanding of what effects our environment and a desire to protect it. Working on our Chapter Events is perfect for a guy who can't stand to miss anything. This is the same quality I brought to my stint as Chapter Rep for the Hernando Chapter. 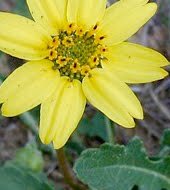 By day, I am a geologist at the South West Florida Water Management District, and I enjoy proving that native plants can survive abuse in my Hernando landscape. Out in nature is where Heather wants to be. An artist and rock climber, a period costume designer and friend to all, she brings a get-it-done attitude to the Hernando Chapter. In addition to serving as Secretary, Heather volunteers at the Nature Coast Botanical Garden and on all field trips. Heather Sharkey works for the Florida Forest Service eradicating invasive exotic plant species from our forests. 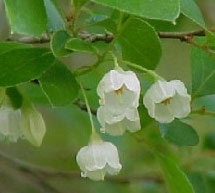 Bruce Vanderveen has been an avid plant enthusiast since the 1970's. 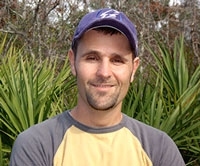 He has a Master's Degree in Plant Ecology from the University of South Dakota. Photography is one of Bruce's passions (especially plants of course). 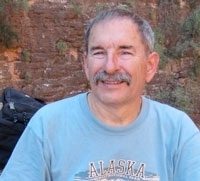 Now semi-retired, Bruce enjoys Eco-travel with his wife Linda - both in the U.S. and Central America. 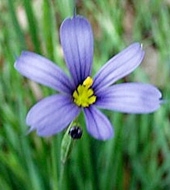 Bruce is a long time member of the Hernando Native Plant Society and presently works with the website and membership.